Big announcement – Mass study aims to change the world’s dreams! Today I am launching a new mass participation project and I would love you to be involved. 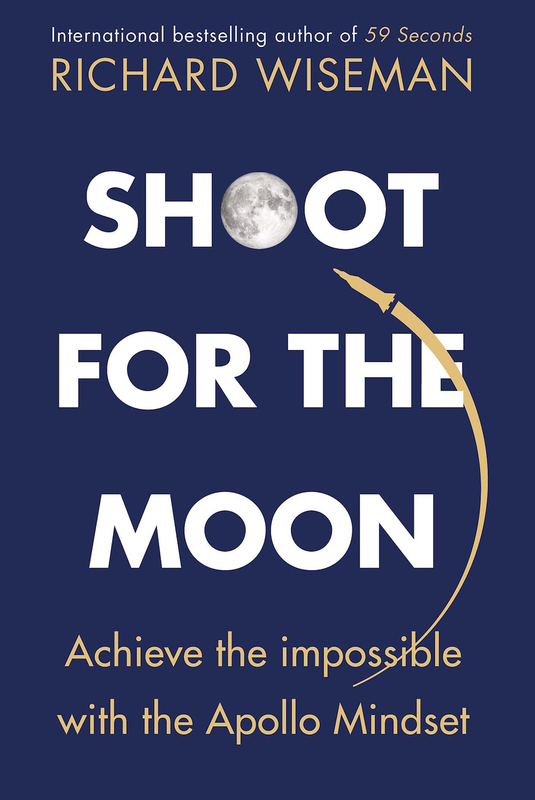 It is ridiculously ambitious, but if it works we could change the world! In a nutshell, we want to see whether we can give you your perfect dream! 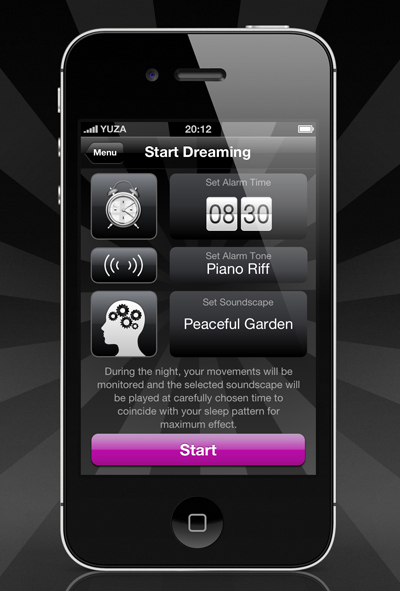 For the past year I have been working with app developers YUZA to develop Dream:ON. The idea is simple. Before you go to bed you decide when you would like to wake up and what type of dream you would like to have (perhaps a stroll in the countryside or relaxing on a sun kissed beach). You then place the iPhone on your mattress and it monitors your movements 20 minutes before your desired wake up time. When the app detects a lack of movement – which is indicative of you dreaming – it quietly plays a carefully selected soundscape that has been designed to influence your dream (think birds tweeting and waves gently lapping against the shore). The app then gently wakes you up and prompts you to send in a brief description of your dream. The app also shows you a graph of your sleep levels throughout the night, and includes an intelligent alarm to help ensure you wake up from shallow sleep. Will it be possible to influence your dreams? If so, can we get people all over the world to enjoy wonderful dreams and wake up feeling happier? I would love you to take part. Both the app, and soundscapes needed for the experiment are free (it is possible to purchase additional soundscapes if you want). To discover more, and download the app, please visit the project website here. Thank you and sweet dreams. There is a similar Android App already called “Sleep as Android” that does the monitoring and waking up bit but not the dream manipulation. Could be in a future version. I’m fairly sure it was posted nine days too late. I guess Apple fans can always dream of learning the basic rules of English grammar and capitalisation. Maybe when Apple start doing more than 3 phones they might actually become desirable. Until then it seems one huge mistake not to have this on Android, which holds most of the UK market on phones by quite a long way. What I love about it is how it doesn’t even start off saying (or apologising) that it’s for iPhone owners only, the whole text just assumes you are one. What I love about it is how it exposes how a supposedly more intelligent crowd still has their personalities wrapped up in the type of phone they use, and how judgmental they are of people who use a different phone. Yeah, I hate that too. Android users far outnumber iPhone, and yet so many companies that release apps just assume that iPhone is the only market out there. The comment I read actually wanted an *apology* for some unfathomable reason. Your own lack of self awareness as you proceed to whine about your phone is all the more amusing. Grow up; it’s just one app on one phone. @stupid it’s not our personality that’s wrapped up in the type of phone we use,our ability to take part in the experiment is. The call for some recognition of this fact from someone who has been excluded IS fathomable (by the more intelligent crowd). Get some perspective. Billions of people are “excluded” from billions of things every day. Stop carrying a cross for your silly little smart phones. IS, with the greatest of respect I really think you are the one who is losing a little perspective. All that Alex pointed out is that the website does not mention that the app is currently for Iphones only. There was no suggestion that the type of phone one has somehow indicates their level of intelligence nor does it imply anything about the personalities of owners of different types of phone. Yes, lots of people are excluded from lots of things every day, but you seem to be trying to chastise those who wish they weren’t excluded. I see no cross carrying going on (nor torch carrying, which is what I suppose you really meant), just someone voicing that he wishes he could get involved in this experiment. I’m at a loss to understand why that bothers you so. @Impossibly Stupid: Make up your mind what you’re complaining about. One minute, it’s people being judgemental of others’ phone choices, then when called on the non-existence of such judgemental opinion, you retreat to complaining about a supposed sense of entitlement based on a parenthetical word choice. The fact is that Richard either chose not to mention the currently single-OS nature of the app, or it never occurred to him that not everyone uses iOS. Given that we had a similar kerfuffle over his last big foray into apps (the Telepathy app) back when Android users were a minority, it seems unlikely that he is not even aware of the existence of Android users among his readership/fanbase. The only conclusion seems to be that he has actively chosen to ignore a significant percentage of his own fanbase. Not by getting the app developed for iOS first, but by not even mentioning it. It’s not the phones that are miffed/insulted/bothered/excluded, it’s the fans that own them. Kentuckyfreethinker, Impossibly stupid doesn’t have the same opinion with you, becuse your personality is still wrapped up in your android phone. Five stars to Impossibly Stupid comments, I completely agree. It is only a phone app, so no point to get down to discrimination that Abdroid has been excluded. It is what it is, live with it! Should add though that I like the idea in general and good luck with the experiment. Can it be an April Fool’s Joke? What are we supposed to be “laying on a sun-kissed beach” – eggs? I’m guessing this doesn’t work with a memory foam mattress? in the meantime I’ll try using postcards. My HTC Android phone has a position detector as well, so I’m assuming it’ll detect movement too. Which means there’s no hardware-based problem (at least not for most phones, as mine is a cheap Wildfire) preventing this app from being useful in Android. I know far more Android users than I know iPhone users, so why make the app Apple-exclusive? Aha, just found the bit on the website that says an Android version will be launched later this year. Looking forward to it! I can’t find this in the Play Store! If you want a sample for your experiment, don’t ignore the market-leading smartphone platform! From the same developer – a data Uploader app for the Lucid Dreaming app. Maybe you should get in touch, Richard! Richard, Very interesting, please notify us when you have an Android version. This is just a way to just to make money off of a smartphone application! As a prominent scientist, I too was offered to endorse an Iphone App for a percentage of the profits. BUT! I turned it down!!! I would have made substantial income from endorsing the Iphone App BUT I have integrity! AND I cannot be bought! As any scientist knows, nothing can be scientifically proven in a “MASS EXPERIMENT” such as this! A controlled environment is the foundation of science studies!!! I am upset because there are too many PHDs prostituting themselves to make a buck off of these smartphone apps. Frankly, it’s making all of us PHDs look bad!!!! I don’t have a fancy phone (iphone or android or whatever), but I’ll tell the boyfriend about it. I can influence my dreams anyway. I just think about whatever it is I want to dream about (usually flying) frequently during the day, and I end up dreaming about it. Easy. Since the app only really provides a background for your dream (countryside, beach etcetera), I’m assuming your brain would fill in the details with anything it wants to dream about. No telling who you’ll meet on your countryside stroll, or what boat will sail up to that beach. Hi, saw this on the Daily Mail, interesting experiment. For those Android users who are overlooked, perhaps Prof Wiseman wants to consider using the Zeo Sleep Manager Android API. For starters, by using actual neurofeedback as a direct measure of brain state, it will much more accurately detect REM sleep than the indirect movement based systems can. No movement = REM is a BIG assumption after all. Seeing actual EOG activity like Zeo does, is a far more direct indicator. Add the Android API they have published and allowing open access to, Prof Wiseman could easily whip up an app that plays the soundscapes the moment Zeo detects REM. Win-win for all. how in the world does a phone work as an EOG! My iPod touch seems too old to work with this piece of software. Me sad. I would love to try this out but until my wife and I decide to sleep in different beds, possibly in different rooms, this just isn’t a posibility. I suspect most couples will have similar problems. Let’s say participant X in this experiment decides they would like to have the countryside stroll soundscape played to them. They wake up the next morning and report in that they dreamed of a countryside stroll. So, how is this study supposed to tell us whether the dream was influenced by the app or simply by the participant’s decision to choose a particular soundscape? I was thinking that too. To me a better experiment would be to run the app over night but not select the dream you want. When you wake you select which dream you had, if any, and send. Then you find out which dream was randonly chosen for you by the app. Besides, what exactly does a countryside stroll sound like? In whose country? I don’t think this is supposed to be an entirely robust experiment, rather something fun and a little silly. Lol. U had a good point 2 be made dave. I can’t help thinking that there’s a lot more to this than meets the eye. Mass-participation experiments of this kind are usefull for measuring people’s perceptions, but without hands on controlls I’m not sure how valid or valuable the data will be. Thime will tell, I’m sure. You are correct. This is just a way to just make money off of a smartphone application! As a prominent scientist, I too was offered to endorse an Iphone App for a percentage of the profits. BUT! I turned it down!!! I would have made substantial income from endorsing the Iphone App BUT I have integrity! AND I cannot be bought! As any scientist knows, nothing can be scientifically proven in a “MASS EXPERIMENT” such as this! A controlled environment is the foundation of science studies!!! I am upset because there are too many PHDs prostituting themselves to make a buck off of these smartphone apps. Frankly, it’s making all of us PHDs look bad!!!! If you wanna change the whole world maybe providing the app for both iPhone and android markets would be a good idea. Just sayin. Sorry Richard but just don’t buy this. Am I just too skeptical? No, you’re cynical. Please stop mistaking cynicism for skepticism. You are correct. This is just a way to just to make money off of a smartphone application! As a prominent scientist, I too was offered to endorse an Iphone App for a percentage of the profits. BUT! I turned it down!!! I would have made substantial income from endorsing the Iphone App BUT I have integrity! AND I cannot be bought! As any scientist knows, nothing can be scientifically proven in a “MASS EXPERIMENT” such as this! A controlled environment is the foundation of science studies!!! I am upset because there are too many PHDs prostituting themselves to make a buck off of these smartphone apps. Frankly, it’s making all of us PHDs look bad!!!! I was going to complain about the lack of an Android version (a recurrent theme from Professor W), but insofar as he’s attempting to influence people who can’t think for themselves, he’s probably right to stick to iPhone owners. Is this available for the Atari2600? It was free, so I went ahead and loaded it. I will report back with results. Will it work on my landline? I haven’t got a phobile moan. Two yogurt cartons and a bit of string, etc. Come on people, that’s enough brand-based mud-slinging now; if I want to see gangs calling each other names, I’ll visit the local school playground. Personally I have some doubts about this idea, but it might be interesting to see what happens anyway – it’s intriguing. There are only three comments slinging mud at users of particular brand. That seems remarkably restrained. Maybe the real experiment was to see how people react in an open forum when a semi-desirable application isn’t released on their preferred mobile operating system. Surely I can’t be the only one who thought of Aerosmith here. I wish I could try this app, but I use Android because I’m not religious. apparently I never enter a deep sleep. I paid for a lucid sound scape and it has never deemed my sleep worthy of playing it for me. Releasing an iphone version before an android version, despite there being fewer users? Somebody stuffed up. I think it is much easier to release an iPhone application than an Android application. For one, there are many models, each with different hardware and variations in software. That means a lot more tweaking and checking for bugs. Mi chiamo Agnese Pellegrini, ho 35 anni e non ho mai dormito bene di notte. La mattina mi sveglio molto più stanca di quando vado a dormire. Ho letto però un articolo sui sognatori lucidi e ho deciso di scriverle. Nei miei sogni c’è un io che sogna e un io che è consapevole di far parte del sogno e di star sognando. Tanto che, se il sogno non mi piace, io lo cambio. Stanotte per esempio ho sognato di incontrare una persona. Quella persona però non mi era simpatica, così mi sono detta: cavolo, il sogno è una mia produzione, quindi se non mi piace posso cambiarlo e posso scegliere di incontrare un’altra persona più simpatica. E così è stato. A volte ho avuto episodi di sonnambulismo e quasi sempre durante il sonno parlo o piango. Molto spesso sogno persone morte, o persone che voglio sognare. Non so se la mia esperienza può esserle utile. A me sarebbe davvero molto utile conoscere un suo parere. This is just a way to make money from a popular idea. There are many websites and “P.H.D.s” who are making a killing by exploiting Iphone Apps (droid, etc). There is no way that a simple device such as an Iphone can detect your sleep. I can guess, with experience, as I am a P.H.D. myself, I can guess that this will work about 2% of the time! This just goes to show that even P.H.D.s are no different than anyone else. Integrity has a price. Apparently a few $100k is not worth anyone’s integrity, epecially an P.H.D. Throw it all away and prostitute your education……Shameful!!! Waiting for Android… Come on we are 2/3 of the Market!!! Previous Answer to the Friday Puzzle…. Next Dream:ON first night – how did it go?